One of my proudest and most shocking moments of being a BCBA/Mom was when my son came home with a self-monitoring form designed by his teacher. 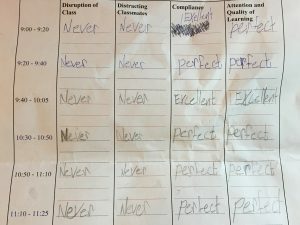 Not only was the teacher being proactive in managing my son’s behaviour, but he implemented it almost perfectly! The best part – it worked! The goal of self-monitoring systems is for the student to be able to record and track his/her own behaviour. The very act of recording and tracking can change the frequency of behaviour. Similarly, in many weight loss programs, the participants are asked to keep a “food diary”. Often, just the act of writing down every single food you eat acts as incentive to not eat as much! So how should self-monitoring systems be implemented? A well-defined behaviour is observable and measureable. State the behaviours you want to decrease as the positive opposite. Instead of “No screaming” say “Use indoor voice”. Before starting any reinforcement system, it’s a good idea to include some role-play so that the student really understands what’s expected of him. Week 4: gradually fade the teacher’s ratings by using random, matching challenges that occur periodically. Make it manageable for the student to record his own behaviour. This can be either by dividing the day into intervals (15, 30 or 60 minutes) or by giving him a signal when recording should happen. In order for self-monitoring to be successful, there should be some external reinforcement or positive consequences contingent on student’s ratings. 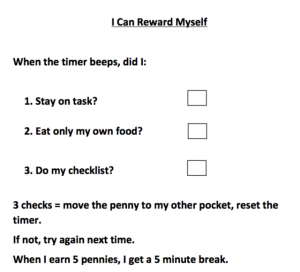 When first introducing a self-monitoring system, reinforcement should be often. Set the criteria so that the student is more successful than not. For a student just starting, he should access reinforcement at least daily. Once the student gets better and more accomplished, the criteria can become more difficult and reinforcement can happen less often. With students being active participants in their behaviour plans, they will hopefully have improved confidence and competence. This entry was posted in ABA, Autism, Behaviour, teachers. Bookmark the permalink.